I’m a history buff as are Bookworm and Cuddle Bug. PB & J Girl (9), not so much. In fact, getting her interested in any history has been a struggle, until we had the opportunity to review a homeschool video curriculum by Drive Thru History Adventures with Dave Stotts. There are many other items available on the website in addition to the courses listed above. To enrich the classes, you will find suggested readings. For instance, in the American History Adventures, one of the suggested readings is a full text download of Chapter 2 of Benjamin Franklin’s biography. There are also worksheets and answer keys for each episode. I asked PB & J Girl some questions from these to make sure she was paying attention, but I didn’t have her write the answers. I just had her answer some of the questions orally. The content on the website is kept fresh in a number of ways. In addition, Drive Thru History Adventures has a separate component, Adventures TV. This is the streaming version of Drive Thru History Adventures and can be used for viewing on your mobile device. Here you’ll find all episodes of the three different courses mentioned above as well as the other videos found on Drive Thru History Adventures. You need to first have a subscription to Drive Thru History Adventures. Each episode is approximately 27 minutes. As I said, PB & J Girl does NOT like history. The thing that really hooked her in with these videos was Stotts’ humor. Throughout the videos, he’ll sometimes dress funny, or do some funny move like pretending to trip out of his vehicle when he’s trying to get out. My daughter loves this part of the show, and those few moments of humor are what bring her happily to watch the video and learn about history. She also loves the blooper segment at the end of each episode. Having said that, Stotts is not all comedy; he can be serious throughout the show. I loved that he includes information about lesser known, though still important, figures in history such as George Whitefield and Tadeusz Kosciuszko. I also love that the Stotts goes on location to each place, so the viewers feel like they are right there with Stott, at the exact location where history occurred. To me, that makes learning about history much more interesting than just reading about it in a text book. A few years ago, we went to Boston, and when we got to Boston in one episode, PB & J Girl remembered all the places we had been by seeing Stotts at them. Finally, I really enjoyed the Drive Thru History Adventures Facebook page. There is a moderator, but Stotts himself often pops on to leave comments and interact. Also, they pay attention to what people mention on the Facebook page. For instance, people wanted closed captioning on the shows, and at the time of this writing, closed captioning had been added to The Gospels, and next up they are planning to add captioning to American History Adventures. One member asked if it would be possible to get a coloring sheet of the Drive Through History Adventures badge, and in less than a day, someone on the team had created one! 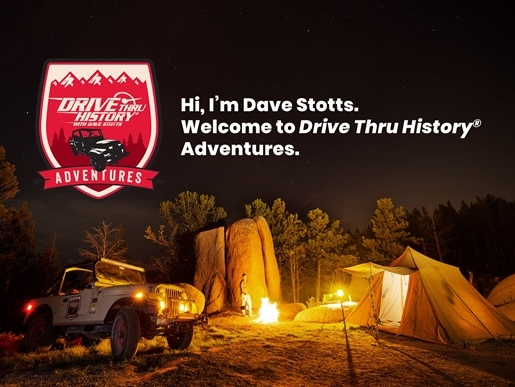 If you want to bring history to life for your children, or if you have a reluctant history learner like I do, you can’t go wrong with Drive Thru History Adventures! Drive Thru History Adventures is for $124.99 annually, or $12.99 monthly. However, there are currently some deals available. You can go here to save $2.50 off the annual subscription AND receive a free DVD of Gospels. Or, you can receive the 20% off discount listed on page 19 of the latest digital edition of The Old Schoolhouse® Magazine.